Figure 1 | Comparison of contact geometries. The upper left panel shows the experimentally deduced contact lines. 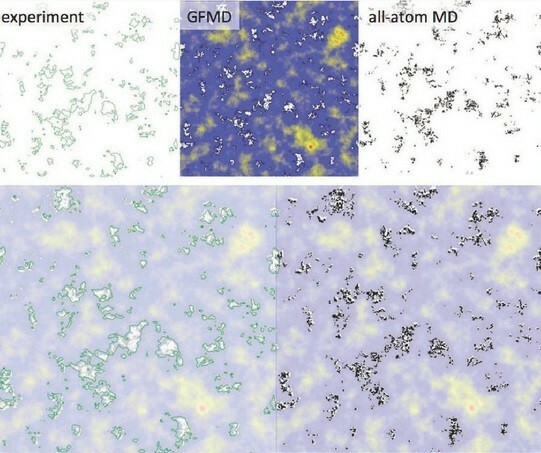 The center top panel shows the gap topography obtained with Green’s Function Molecular Dynamics (GFMD, white is contact, gaps from small in black through blue and yellow to large in red). The upper right panel shows atoms in contact (black points) as obtained by all-atom molecular dynamics. 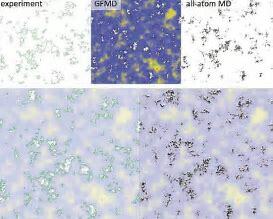 The lower row shows the superpositions of GFMD with experiment (left) and with all-atom simulations (right). Published with permission from Ref . BECAUSE TRIBOLOGY IS THE STUDY OF contacting bodies in relative motion, a fundamental issue is to understand the nature of the interfacial contact as a function of load for a particular combination of materials. While the contact problem for smooth objects is generally analytically soluble, and always straight-forward to tackle computationally, real engineered surfaces are almost never smooth. During the intervening 50 years, a bewildering array of contact models have been developed, consisting of both analytical models that extend Greenwood and William-son’s ideas, and numerical models with different levels of complexity. 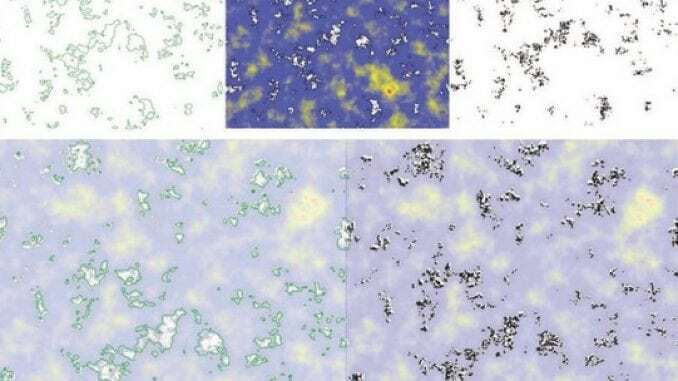 Consequently, it has become very difficult for experimentalists to decide which approach they should use to model a particular property and how accurately it reproduces reality. To remedy this situation, we issued the Contact-Mechanics Challenge at the end of 2015.2 Prof. Martin Müser of Saarland University in Saarbrücken, Germany, carried out a brute-force calculation of a rough surface with a moderate amount of adhesion. The topologies and properties of the surface were published on the Web, but the solution to the contact problem was kept secret. Members of the tribology community were then challenged to submit their own solutions and provide information on properties such as mean gap, contact stiffness as a function of load, distribution of contact patch size, interfacial stress or interfacial separation as a function of load. the University of Florida took an experimental approach by 3D printing the rough surface and directly measuring the real contact area using a frustrated total-internal-reflection method. The results also are displayed in Figure 1 and show remarkable agreement with the theoretical predictions. In addition to the summary of the result in reference , several co-authors have submitted companion papers that describe their analysis of this problem in greater detail. This paper and its companions will provide an important resource not only for experimentalists wishing to know which method is the best one to use to analyze their results but also for theorists striving to improve and simplify methods for analyzing rough surfaces. In recognition of the importance of this work to the tribology community, Springer-Nature has made this an open-access paper, making it available to the tribology community worldwide at https://doi.org/10.1007/ s11249-017-0900-2. Greenwood, J.A. and Williamson, J.B.P. (1966), “Contact of nominally flat surfaces,” Proceedings of the Royal Society of London, Mathematical and Physical Sciences, A295, pp. 300-319. Tysoe, W.T. and Spencer, N.D. (2015), “Contact-mechanics challenge,” TLT, 71, p. 96. Müser, M.H. 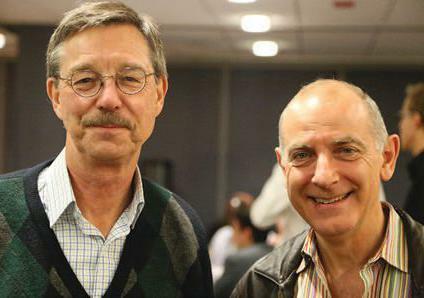 and 34 co-authors. (2017), “Meeting the contact-mechanics challenge” Tribology Letters. Material provided by TLT magazine.